Descent of Minnesota Cemetery Lots at Death. Gary C. Dahle, Attorney at Law. The legal Descent of Minnesota Cemetery Lots at Death is achieved under Minnesota law like no other probate transfer. for a possession of a burying place. there they buried Isaac and Rebekah his wife; and there I buried Leah. 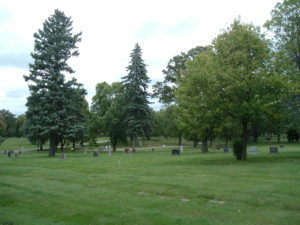 The Magna Carta of the disposition at death rules for a Minnesota cemetery lot is found in M.S., Section 525.14 – Descent of Minnesota Cemetery Lots. Subject to the right of interment of the decedent therein, a cemetery lot or burial plot, unless disposed of as provided in section 306.29, shall descend free of all debts as follows: . . . The above provision is contrary to the understanding of a life estate that a Minnesota probate or real estate attorney would typically have – who recognizes that life estates normally terminate at death – and do not continue thereafter (with a right of internment). In addition, the above references to the “fee” title are somewhat misleading, because Minnesota Statutes, Chapter 306 and 307, limit “ownership” of the cemetery lot by individuals to something considerably less than “fee” title. (4) if there is no surviving spouse, child or sibling of the decedent, then, if not sold during administration of decedent’s estate, to the cemetery association or private cemetery in trust as a burial lot for the decedent and such of the decedent’s relatives as the governing body thereof shall deem proper. Assignment section of the Decree of Distribution should assign the Minnesota cemetery lot(s) to the person who would take the Minnesota cemetery lot(s) pursuant to the provisions of M.S., Section 525.14.